5 Ways The Web Is Challenging The Pricing On Fashion Products. 1. Online presentation has limited ability to show the quality of the fabric and fit. Many e-commerce brands in the space are trying to solve this problem by adding video, zooming tools, virtual “try on” functions and more. But the challenge is there to differentiate between a similar product in different production quality and pricing points. Example – Alexander Wang black t-shirt ($106) vs. American Apparel one ($20). 2. The internet is still a flat medium, a projection of reality lacking physical experience. As opposite to brick and mortars world, where retail brands have more control over the venue, service, personnel and atmosphere – online the world is flat and even after almost 20 years of existence most websites still look very similar. Example: Louis Viutton website isn’t that different from JCrew, if you look up close. Of course, the brand appeals to different audiences, but it’s harder to justify such a high pricing gap in the online environment. 3. Shopping comparison engines allow instant research for better value. Only few years ago the only option for a customer looking for a black t-shirt was going to the local mall, checking out few stores and buying the best possible product out of these few options. These days, thanks to shopping search engines like TheFind.com and others, the possibilities are endless (to be precise, my search for a black t-shirt returned 694,091 results, ranging from $3.99 Hanes to $236 Gucci). This means the customer has a better chance to find lower priced product. 4. Websites dedicated to finding discounted merchandise. From fashion blogs recommending “The Look for Less” to coupon sites promoting discounts – the web is a paradise fro bargain shopper. 5. Innovative business models focusing on bargains. There is no coincidence sample sale sites like Gilt, ideeli and Rue La La are flourishing online – the web technology provides the best tools to manage and move quickly limited time and quantities inventory at a very low cost. Various online auction sites offer bargains, and not to mention rental services like Avelle and Rent the Runway eliminate the need to shop for new clothes and accessories at all. In the ongoing debate between quality (luxury) vs quantity (fast fashion) this sounds like a win for quantity. Hypothetically more expensive clothing lasts longer and so you don't have to buy as much; cheap clothing then gets more expensive because you have to keep replacing it. According to this data the additional expense doesn't seem to offset the decreased price in clothing. Unless luxury is getting less expensive as well? I know more and more luxury brands have “bridge” lines or lower priced lines (like A/X Armani Exchange, Kors by Michael Kors, etc) but I'd be interested to know if the cost of a Chanel suit has risen, fallen, or stayed the same (adjusted for inflation, of course). And there's technology, which means you can hypothetically make something of the same quality for less money, but there are so many other variables I don't think you can boil it down to just that. great points! Just researched Chanel suits pricing and it appears a custom suit used to cost around $12,000 before 1971, when Coco died, and now Chanel suits go for $5,000 a piece. Of course consider the $ difference – about X7, which brings the suit cost back then to about $80,000 in today's money. This does prove the point about the price drop of luxury items in general. wow, what a difference! thanks for getting these numbers. Yuli – This is well thought as usual, I'd expect nothing less from someone of your caliber. To go along with innovative business models, I say Gilt leads again. I recently read that they're were doing designer collaborations specifically made for the site. I was wondering when that was going to happen – as designers who work with sample sales sites were going to find the retailers that carry them at full price would start to be alienated with the constant discount and competition. The brands that didn't want to do diffusion lines for Target or H&M, thus risking tarnishing their brand name,are doing exclusive collections for Gilt, a place that known for luxury/quality at a discount. Much less damaging to consumer perceptions. I wonder when they'll do handbag collections expressly designed for Avelle rental, then sold after the collaboration is done? That would be interesting to see. Thanks Macala! Loving the Avelle collections idea. In general – I think designers better invest their energy in optimizing and saving costs on the production process to make the best possible product for the best value, rather than coming up with creative collaborations that allow to sell their product at a discount rate. “One very big reason the percentage of disposable income spent on clothing has fallen is that we have a lot more disposable income than we used to. For example, disposable income -just since the early seventies- has increased 469%. Circa 1970, disposable income was about $4,000. At 6% (listed on the chart above), we get $240 spent on clothing per annum at that time. When you consider the increase in disposable income since then, in real numbers (@ 27K adjusted for inflation) and even at 3%, the median is spending $810 a year on clothing -each. So while the chart shows we're spending 3% “less”, we're spending over 300% MORE since 1970 -in *real dollars adjusted for inflation*. All this chart shows is that the relative percentage of our disposable income spent on clothing has not remained static. 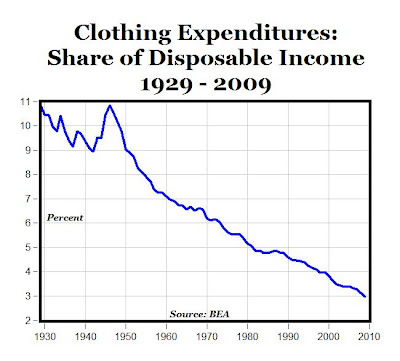 If we continued to spend said 6% of disposable income on clothes today -even tho our disposable income has increased 43% (adjusted for inflation), we would have to spend $1,600 each for the chart to flat line amounting to a 600% increase in clothing purchases.